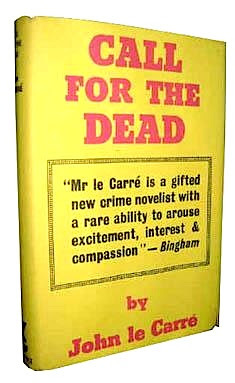 John Le Carré. CALL FOR THE DEAD. Gollancz, London, 1961. Last night I dreamt I went to Manderley again...in fact I dreamt of a fine/fine 'Rebecca' and a shelf full of Gollancz first editions all pristine in their yellow jackets. Orwell was there, Dorothy L Sayers, Gibson's 'Neuromancer', Larry Niven's 'Ringworld', Daphne's even more valuable book 'Jamaica Inn' ...a bunch of early Michael Innes, Visiak's 'Medusa', a 'Lucky Jim'', Charles Williams, Edmund Crispin, Kafka and the first two Le Carré's--with a few signatures and the odd loosely inserted autograph letter a 3 foot shelf of the top titles in fine condition would be knocking on a six figure sum in dollars and with luck even pounds sterling. VALUE? There are a lot about. 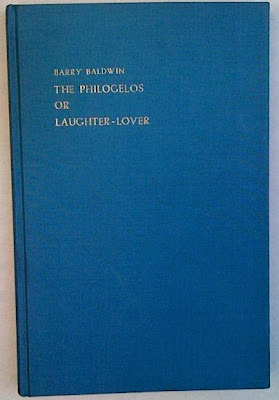 A decent inscribed copy sold last month at Bloomsbury for £3300 + commission and can now be found listed at £9000. It has made more several times in auction without a signature - £8000 at Sotheby's in 2000 and £5900 (In repaired d/j with minor soiling, unsigned) in 2002. While there are a lot for sale at the moment no one is breaking ranks and the lowest price (a modest example but with a TLS loosely inserted) is £4500. A seller in South Africa (something of an epicentre for silly prices) wants £20000 for a very fresh example from his own collection. He also wants to see extra postage ('Courier Service only for this item.') Beware of dealers selling their own collections. several other debutants is worth looking out for, including 'Relations and Contraries' by Charles Tomlinson and 'The Outer Darkness' by Thomas Blackburn, as well as volumes by interesting writers, such as Alan Barnsley, Ursula Wood, Peter Russell, Jon Manchip White and Jocelyn Brooke. Each slim volume had an identical size and design, was bound in card covers and priced at a modest shilling. Each appeared in consecutive months over a two year period and could be bought either from bookshops or directly from the publisher - the American Erica Marx from her home in Aldington on the edge of Romney Marsh. Marx, whose centenary falls this year, seems to have been unusual among literary publishers in that she had liberal, almost altruistic motives. Little is known about her early life, but we do know that before she established the Hand and Flower Press in Kent in 1940 she operated Les Press de L’Hotel Sagonne in Paris for two years. Presumably, like Caton ( who may have been her inspiration ) she scoured the literary press and especially the many ‘little magazines ‘of the forties ( some of the names of which appear in the separate pamphlets ) looking for those who she felt deserved ( as she explained )‘ publication in book form ‘. It would seem that by the mid forties she had already begun to publish the work of poets she admired, such as Thomas Fassam, and the 1950 debut of Michael Hamburger predated his appearance as a poet in pamphlet. Of the twenty six poets she published in 1951 and 1952/3 half a dozen can be classed as outright duds, including Marx herself, writing as Robert Manfred; some of the others already had reputations, such as Peter Russell, the expert on Pound, who was already the admired editor of the little magazine Nine, Rob Lyle, who conducted the Catholic magazine Catacomb, F. Pratt Green, who was an admired and prolific writer of hymns, and the novelist Jocelyn Brooke. Causley, Tomlinson, Blackburn and Hamburger consolidated their reputations as poets. Quite a few of the remaining poets became better known for other things. Robert Waller was to write the intriguing 'Shadow of Authority' (1956), a novel that satirised BBC radio producers, including Geoffrey Grigson and Roy Campbell. Charles Higham, at twenty the baby of the group, became a controversial Hollywood gossip-style biographer, and is still alive. 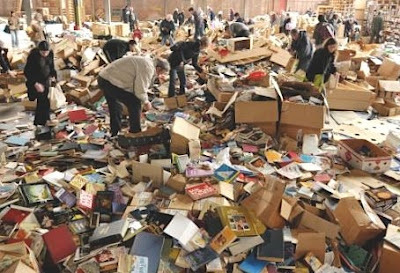 Arthur Constance, the oldest at 60, was a bibliomaniac who by 1951 had already collected a library of 16,000 volumes, including arguably the largest collection of clippings on Fortean phenomena ever assembled —an archive which was scandalously destroyed after his death. Ursula Wood became the mistress of composer Ralph Vaughan Williams in a strange ménage a trois; Alan Barnsley, A.J. Bull, Thomas Fassam, Frederic Vanson and Hal Summers ( a Whitehall mandarin in his spare time ) continued to publish verse, while Jon Manchip White went on to an amazingly prolific career as a novelist and screenwriter, even contributing an episode of the Avengers*** in the nineteen sixties. 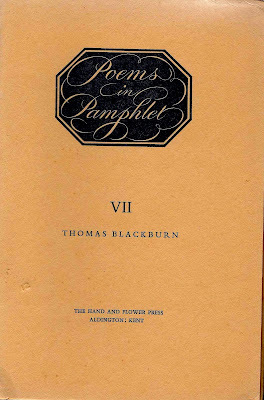 With Poems in Pamphlet it’s best to buy a complete set of all 25 volumes, which one dealer is offering for a modest $200, admittedly a big mark up on the original 14s 6d for the 1951 set ( including postage ), but a bargain considering the big names included in these sets. Separate copies can work out expensive, especially if signed. For some extraordinary reason Bookbarn International want $69.57 for R.H.Ward’s signed Twenty-Three Poems , which makes Hamburger’s debut volume from Martin Booth’s library, for which The Poetry Bookshop asks a mere $40.23, seem a bargain. Similarly, if you pine for a copy of A Time to Speak complete with tipped in dedicatory note by ex BBC employee Gwyneth Anderson ( one of the ‘ duds ‘) it’s yours for a mere £70!! Thanks Robin for throwing light on this slim series. Good to see something affordable and something which if bought carefully (avoiding shacks, barns and the carriage trade) might hold its own in value. Poetry is an investment, sometimes a surprisingly good one...Talking of the great Jocelyn Brooke I have always kept an eye open for his 'Six Poems' which he published privately in 1928. Recently republished (also in 50 copies) by Callum James. *** The episode of 'The Avengers' written by Jon Manchip White was called 'Propellant 23' and aired on 6 October 1962. He also wrote a lot of other 'tellys' including Sergeant Cork (first episode) Witch Hunt, Naked Evil, Mystery Submarine and the movie 'The Camp on Blood Island' (1958) (story and screenplay). Below is an image from his Avengers episode--the plot concerns a lost bottle of rocket fuel and it features Honor Blackman, with Geoffrey Palmer as a nasty piece of work. Manchip White was born in 1924 and currently lives in Knoxville, Tennessee where he still writes novels. 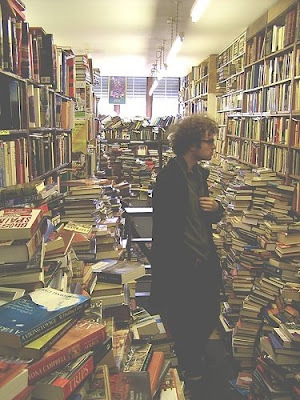 For the Bibliopole, or book-seller, there can be little but praise. 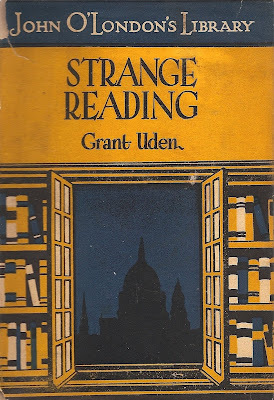 From the stateliest shop of New Bond Street, Albemarle Street or Charing Cross Road, down to the humblest den in a back street or the tumbled stalls of market places, the vendor of books is a magician. Written in the ChesterBellocian high flown manner of the period--a portentous, rhetorical style not unburdened with cliche and platitude but nevertheless refreshing--as a 'benevolent Cheiron' I have nothing but admiration for this Grant Uden. And it is not at all over the top-- surely most booksellers keep a regular supply of 'the elixir of life' under the counter. The slighting reference to MPs shows they were held in low regard even then. There are no bookshops left in Albemarle Street since Thorps left at least 30 years ago, New Bond Street has Sotheby's (sometimes known by rakish dealers as Dotheboys) but Charing Cross Road still has bookshops despite the best efforts of unthinking and unlettered landlords. Max Beerbohm. CARMEN BECCERIENSE. Privately printed (Godalming, 1890). Beccerius | a Latin fragment | with explanatory notes by M.B. [N.D.
About twelve couplets printed on rough yellow paper, pp. 1 to 4, cr. Max also prefigures Joe Orton in his altering of plates in books (something for which Joe, unbelievably, went to jail - because they were library books.) Max tended to alter his own copies. Below is an etching of Kipling from Richard Le Gallienne's 1900 work on him where he has changed the title to 'Rudyard Kipling's soul'. I don't know what the original looked like (although it is a book that can be bought online for £10.) J.G. 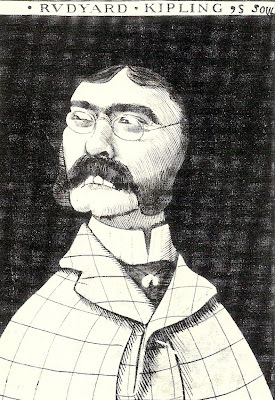 Riewald, a Beerbohm scholar, says 'the portrait has been worked on...and finally transmogrified into a cruel, bitterly satiric caricature full of loathing-"cleft chin, idiot sneer, and eyes jerking sideways as if in panic...' Max obviously had it in for Kipling as he altered the frontispiece of 'Barrack Room Ballads' into a portrait of the author, blood dripping from his reddened fingernails. One is more likely to come across one of Max's altered books than a copy of 'Becceriense'. He is said to have 'improved' quite a few books including works of Virginia Woolf, Lytton Strachey, Pater, Conrad, Housman, Tolstoy, Yeats, Belloc, Henry James, Tennyson and several more Kipling books. 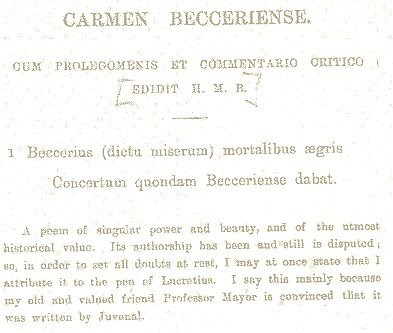 As for 'Becceriense', no copy has shown up as far as I am aware - either in catalogues or in auction... it is almost priceless and Beerbohm surely has one or two collectors with very deep pockets.